Discussion in 'Cards: Strategy and Rulings Discussion' started by bonslypwns, Jan 15, 2008.
it, or you should use it? Well look at it! A simple Lati-Lock that blocks out all evolved Pokemon’s bodies. A great Pokemon when your opponent has any stage 2 Pokemon out. 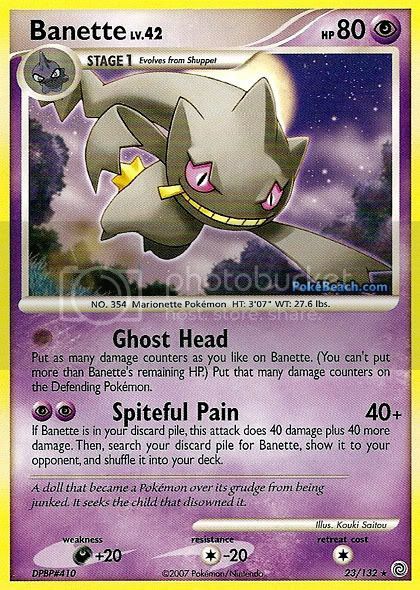 The main attacker, Banette. This Pokemon has two attacks. (1) Ghost Head. A great, but somewhat overrated attack. For no energy you are able to do up to 80, of course there is a draw back. For each damage counter added to the opponent you gain the same amount. Using this attack with Strategy is the best idea. (2) Spiteful Pain. This is what we use Banette for in this deck. For 2 energies you have an instant 40. Of course we have an added effect. If you have any Banette in your discard you can get it shuffle it into your deck, and then do an extra 40! If you play your cards right, that can easily be a turn 2 80 damage, which should be able to beat most things in the first two or three turns. Obviously this is why Ghost Head is here. But of course there are always better combos. (Weakness) Its Weakness is Darkness which adds 20 damage to Banette when being attacked from a Pokemon with this type. With Darkrai increasing its popularity, Banette may be easily knocked out. Not to worry though, a quick Ghost Head can get Darkrai out quick. (Resistance) If Blissey if popular in your area, lucky you. Banette has a -20 Colorless resistance. This will make Blissey attach 8 energies to one shot it. During this time it Banette will easily be set up and Blissey will be knocked out. Shuppet is key for this deck. 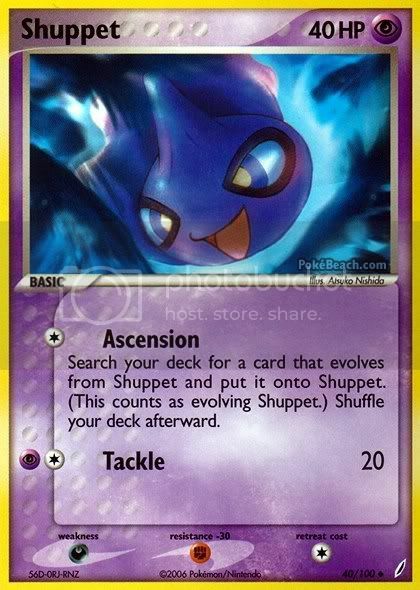 Its first attack, Ascension, allows us to get a Turn 1 Banette straight from the deck and evolve it. Using up are attack phase. Not to worry though. Next turn you get an easy Ghost Head and most likely knock the opponent out. 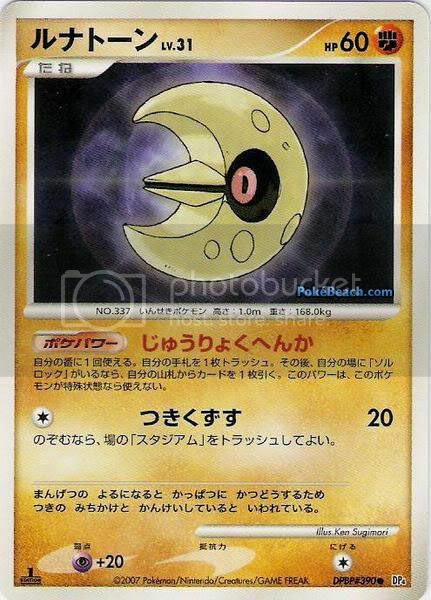 **Lunatone is the core of the deck. Its power plays a large role in the strategy of this deck. 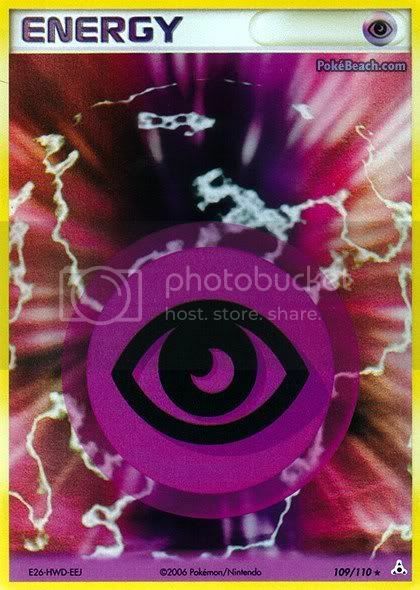 The power allows you to discard any one card from your hand, if Solrock is in play, you may draw another card. Unless you skipped Banette’s role, the discarding is used for Spiteful Pain. The attack can be very useful, for 1 Colorless Energy you can do 20 damage and discard a stadium in play, be it yours or your opponent’s, which can be good, especially if a stadium is over benefiting your opponent like Phoebe’s or Moonlight stadium could be. 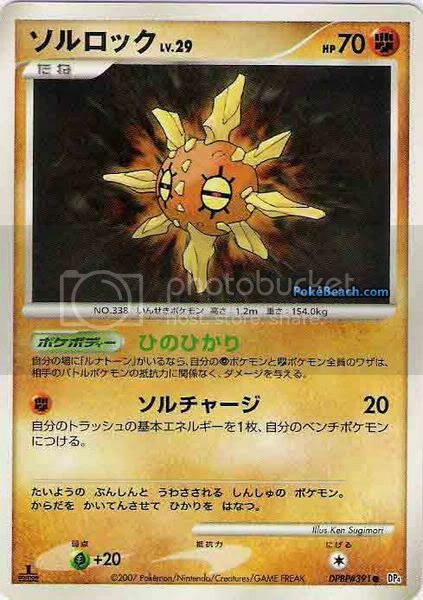 **Solrock is mainly here for benefit out of Lunatone’s Power. But its power is also very helpful when your opponent has Pokemon with Psychic resistance. Darkrai Lv.X (Great Encounters) and Absol (Secret Wonders) both posses a Psychic weakness that subtracts Spiteful Pains damage by 20. Making the attack able to do 60 at the very most. As long as Lunatone and Solrock are in play, all resistance of Psychic (Banette) and Fighting (Solrock and Lunatone) are taken directly off. This can help Banette a lot. The attack allows great energy acceleration for just 1 energy and like Lunatone also does 20 damage. 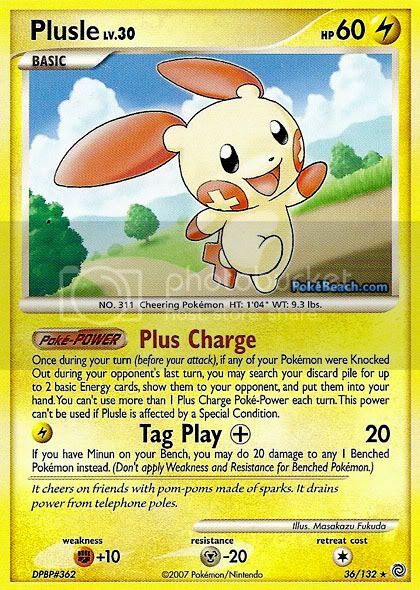 Plusle and Minun are one of the many techs possible for this deck. 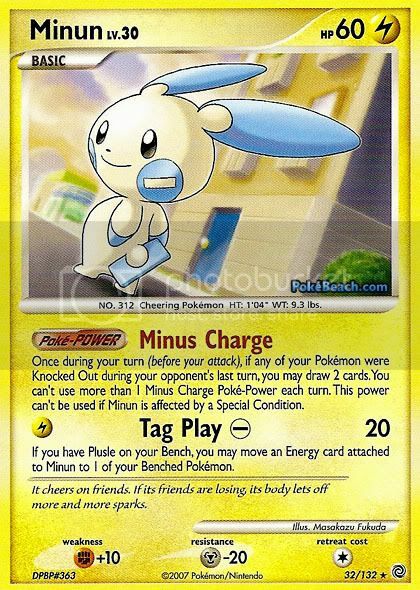 Minun is the best Pokemon that can sit on the bench. After a Pokemon is knocked out, it allows you to draw 2 extra cards. This can help you grab that Banette you just shuffled into your deck. 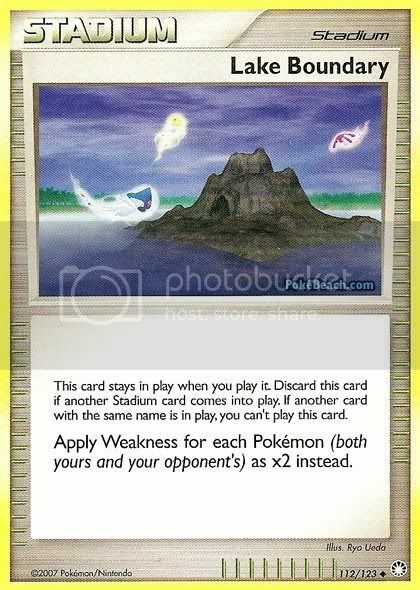 Plusle on the other hand gets you two basic energies from the discard after a Pokemon is knocked out. Since Banette only needs two energies to attack you can easily get them back allowing you to never have energy droughts. Quick Ball is the quickest form of search in the format. And it works best with fewer than 16 Pokemon. 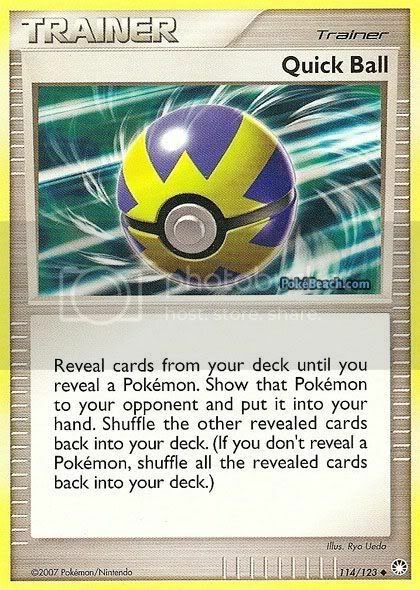 This card can easily grab Banette’s which makes them easier to discard. Allowing us to get an even easier 80 damage. Celio’s Network is back up search. Felicities’ Drawing is the main drawing card in the deck. It gives you a choice between discarding 1 or 2 cards, if you discard 1 you can draw 3 cards from your deck. If you discard 2 you can draw 4 instead. Now if don’t have any Lunatone’s out and 2 Banette’s in hand, this can be very helpful for doing 80 every turn. 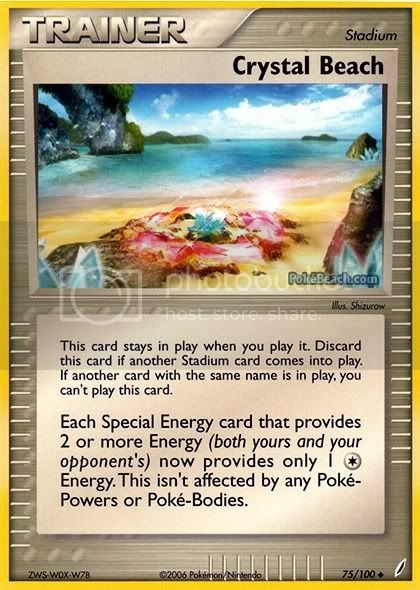 With Plusle and Solrock in the deck for energy acceleration energy can also be easily discarded. Banette has low HP; Potion helps a lot in healing that low HP. Roseanne’s grabs Basic Pokemon and Basic Energy quick so Banette can be set up quicker. Moonlight Stadium gives Free Retreat to all Psychic and Dark Pokemon. Which is very helpful for keeping Banette's alive. If it's over benefiting your opponent you can easily retreat for a Lunatone a discard it. Potion left and a Banette with low HP left, you can retreat it for free. If the stadium benefits your opponent too much, you can easily send up a Lunatone and rid of it. Team Galactic’s Wager allows for hand recovery, be it from an Absol (Secret Wonders) or a bad opening hand. Castaway is easily one of the best trainers in the game. It allows you to get a Tool, a Basic Energy card and a supporter from your deck. Making your deck even faster. Buffer Piece is easily pulled out by Castaway and prevents 20 damage to the Pokemon that it’s attached to. Strength Charm is also one of those Castaway cards. It adds 10 damage to your attack, so Banette can do up to 90 damage. Holon Mentor is for quickly grabbing those Pokemon like Lunatone, Solrock, Plusle and Minun. Crystal Beach is a great Stadium. Most decks like Blissey, G&G, Magmotar and Infernape rely heavily on special energies that provide 2 or more energy. Crystal Beach easily shuts those cards down. Lake Boundary is another one of those great stadiums that turns all weakness into x2 instead of what’s written on the card. This is great for countering decks like Gallade and Gardevoir. 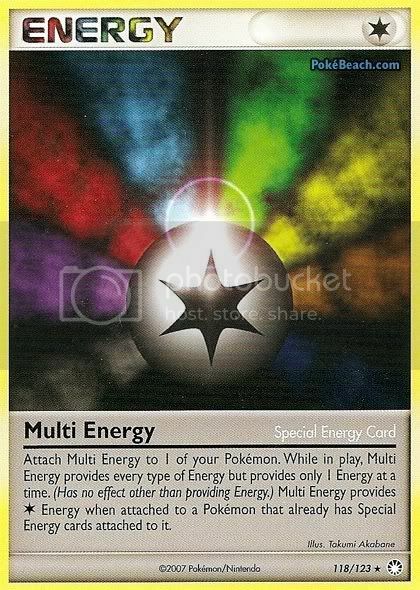 Multi Energy allows, Solrock, Plusle and Minun to attack because they have an energy requirement other than (P). This Power can be used once during your turn. Discard 1 card from your hand. Then, if you have Solrock in play, draw 1 card. This Power can’t be used if this Pokemon is affected by a Special Condition. [C] Shatter: 20 damage. You may discard a Stadium card in play. 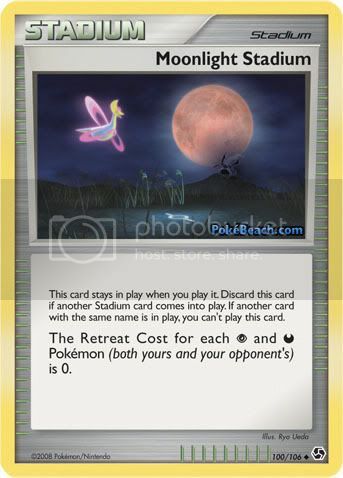 If Lunatone is in play, any damage done to your opponent’s Active Pokemon by your Psychic-type Pokemon and Fighting-type Pokemon isn’t affected by Resistance. [F] Sol Charge: 20 damage. 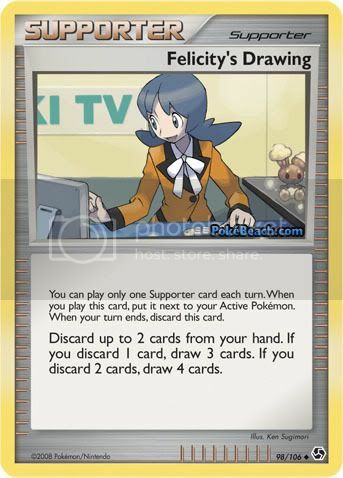 Attach 1 Basic Energy card from your discard pile to 1 of your Benched Pokemon. Don't ya think Potion needed? Snipeson bench=heal. Ghost Head= heal. Did you like it? Yea, it won! Get rid of 1 Solrock, 1 Plusle, 1 Mr Mime as they are completely useless. Potion unfortunately has to go too because if you ghost head yourself, and have 10 remaining, anything can OHKO you. Oh and you need 2-3 Mentor so all your quick balls will be Banettes. anyways, i don't think this deck will work. Agreed because with so many techs you're not gonna start with Shuppet most of the time. To make things worse, they dont have a " I give my partners free retreat and extra HP bodies "
there is no banette ex so this loses. That's because this is modified. The techs are used for purposes, but I do think it has a chance... wow guys, don't even consider much and just say it'll lose. Mr.Mime needs to stay because Mirror decks, allow you to get your banette ready, then hit them hard. -Plusle, 2 Lunatone, Mr. Mime, 3 Potion. Pichu: No Lunatone!? That's the main strategy to this deck. if your going with that strategy,why not run some birch? discard with lunatone,and skim your hand down,then draw it back with birch. i was jk. i think this could pose a serious threat to some decks in the format. good luck with it! No changes? You think it's fine? But yea, i'll prob have 1 pheobes, 2 Boundary instead. But at least 1 Solorokc is nice... Solorock=Honchsol means you have a chance. Nah I dont think phoebe is needed. use 2 beach and 2 boundary. play 1 solrock 2 lunatone. Mr.Mime needs to stay because Mirror decks, allow you to get your banette ready, then hit them hard. ...Ghost Head. 70 damage. Knock out. I'm not knocked out.